Optio cares deeply about its employees and their respective communities, and is committed to sharing resources with those in need via ongoing philanthropy. Optio was recognized by the California Association of Collectors with its 2014 Outstanding Community Service Award. Employees regularly participate in the ACA Collectors Challenge to help the ACA International Educational Foundation in its efforts of providing scholarships to employees of the credit and collections industry and their families. Team members participating in holiday food drives aggregate turkeys and fill barrels of food for the Committee on the Shelterless (COTS) and its Thanksgiving Day turkey drive partner, the Redwood Empire Food Bank. The staff also supports the Salvation Army’s Angel Tree program, the American Cancer Society’s Relay for Life, the ALS Ice Bucket challenge (photo below) and more. 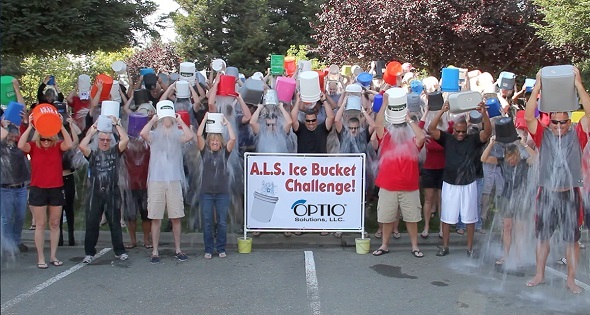 In recent years, Optio employees have stepped up to the plate to support victims of national disasters through the American Red Cross and its own independent efforts. In 2015 and 2016, donations were distributed to help victims of hurricanes, earthquakes and tsunami as well as victims of the North Texas tornado and the Valley Fire in nearby Lake County, California.